Stylish metal handlebar mount, machined in aluminium with a smooth, quality matt black finish. Handlebar base gives a 25mm (1 inch) ball with anti-slip properties & fits other mounting systems using the 25mm / 1 inch format. Includes 3 handlebar spacer/adapter rings of different widths - choose the appropriate size for your handlebar. Uses - compatible mounting systems using a 25mm / 1 inch ball format. 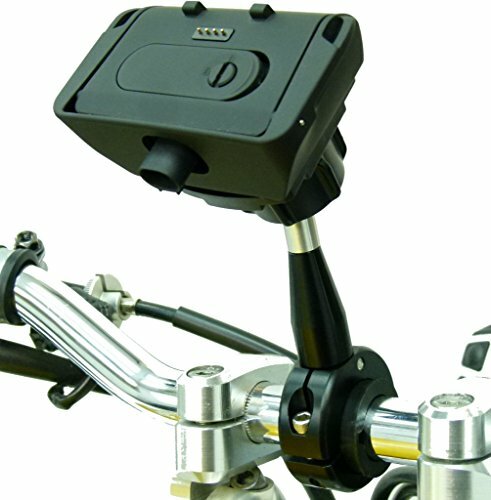 Use with Ram motorcycle mounts, Ultimate Addons, SW Motech and BuyBits hybrid mounting solutions. Extension gives an extra 9cm (3 1/2 inch) (measured between handlebar & ball centres) - useful clearance to avoid clocks or tank luggage. Includes BuyBits powered dock for TomTom RIDER, RIDER 2, Urban Rider, Rider PRO only - please check your model before ordering.